Below you can find answers to most questions about using TRILT and the Off-Air Back-Up Recording Service. If you can’t find what you are looking for please don’t hesitate to contact us. What channels do you record? Do you record regional variations? Can you supply subtitled and audio-described programmes? Do you record 24 hours per day? How far back does your archive go? How many missed recordings can I request? I want to request a complete series. How many Off-Air requests will that require? What is a TVI programme? I need a specific broadcast or a “signed copy” of a programme. How do I make sure I receive the right copy? I cannot find the programme I am looking for. Can somebody help me? How do I set up an Auto Alert? I have not received confirmation that my requested programme has been ordered. Is there a problem? I want to request a programme but TRILT says my institution does not have a nominated Off-Air Representative. What is this? I want to request a programme but TRILT says my institution is not set correctly. How do I do this? My institution has not used all of our Off-Air allowance this year. Can we carry the remainder over? What happens if my institution uses up all of its requests during the membership year? When I attempt to login to TRILT I receive an error message, followed by a Problem Reference Number. What’s causing this? The Off-Air Back-Up Recording service records London broadcasts of BBC1, BBC2, BBC4, ITV1, Channel 4, Channel 5 and More 4. We also record BBC Radio 4 and BBC Radio 4 Extra. Although you can find full regional broadcast data within TRILT, the Off-Air service does not record regional variations. The service is able to supply subtitled programmes if they were broadcast after 1st August 2009, when we began recording on Blu-Ray. Unfortunately we are only able to supply audio-described programmes if they have not yet been broadcast and special arrangements are made before hand. If you would like to request an upcoming broadcast with audio description please contact the Off-Air Department. We began selective recording on 1st of June 1998. Coverage was then increased substantially, and we began recording 24 hours per day as of 1st August 2009. Off-Air requests are split into two categories, Archive and Local, depending on their broadcast date. Archive recordings, which are not held on site in London, can take up to 5 weeks for completion. Local recordings will typically take up to 7 days. The number of Off-Air requests your institution can make each year will depend on your level of membership. Standard, Premier and Enhanced Premier members will receive an annual allocation of 24, 50 and 150 requests respectively. You will need to make a separate request for each episode in a series. This also applies to TVI programmes (see below), where complete series’ are listed as single records within TRILT. TVI programmes are identifiable by their IDs, beginning with TVI*****. These are programmes broadcast prior to 2001, the data for which was migrated from the BUFVC’s former television index. You will find that all episodes from a series broadcast during this period will fall under one record, not as individual records, as with later programmes. If you are requesting a TVI programme, please ensure you specify the part(s) you require. Each part requires one BUFVC request submission. 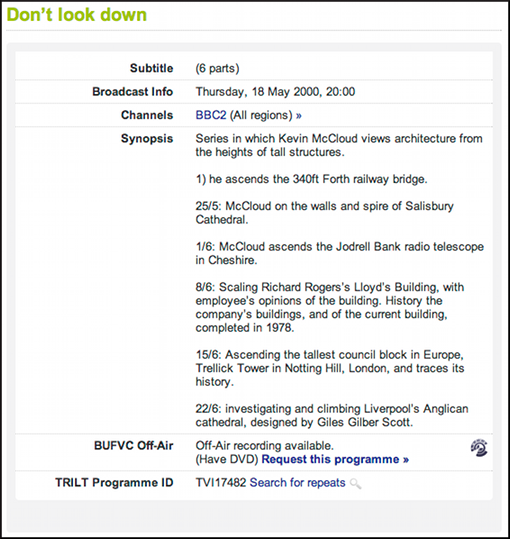 In the example below, if you wished to request the second part, “Salisbury Cathedral”, you should enter the transmission date listed in the broadcast info field (23 May 2000). To request all six parts you should submit six separate requests. You can make specific requests using the “requester notes” field on the ordering page. Where possible we will always try to accommodate you. If you cannot find a programme in TRILT that you are sure has been broadcast please don’t hesitate to contact a member of the Off-Air Department. We are happy to help with whatever you need. Setting up an auto-alert within TRILT is a quick and easy process. Simply define your search parameters, run your search, then look to the bottom of the ‘Current Search’ section, located on the left-hand side. There you will see the Save as Auto Alert link which, once clicked, will take you to a page where you can define which day you would like to receive your alert. This can be changed or removed at any time by clicking Auto Alerts in the ‘My BUFVC’ section. Your institution’s nominated Off-Air Representative is responsible for authorising programme requests made by staff and students. Depending on your institution’s level of membership the number of Off-Air requests you can make per year may be 24, 50 or 150. For this reason Rep’s are required to ensure that all requests are used for their intended purpose. To set your institution please login to TRILT and go to your Preferences section. Ensure that your name, email and institution have been set correctly, and save any changes you make. If you continue to experience problems please contact us. If you are a member of staff or student and have placed a request but not received an order confirmation email, it may mean that your institution’s nominated Off-Air Representative (see above) has not yet authorised your request. If you require the programme urgently you may wish to contact your Rep directly. They can usually be found in your Library or Learning Resources Centre, or you can contact the BUFVC in order to find their details. Yes, you may carry over any unused Off-Air requests for up to one year; however, you will lose any unused requests allocated before that time. If your institution is in need of additional off-air requests you will need to upgrade to the next level of membership. To see which level you will need to upgrade to please visit our membership page. The cost of your current level will be deducted from the next, i.e, if you have already paid £500 for Standard membership, you will only pay £780 to upgrade to Premier (note that in this instance you will receive 38 additional requests, as you have already used 24 of the 50). Your institution has changed their authentication configuration, resulting in a change of idP (Entity ID) or loss of required attributes. Your institution’s authentication configuration may not be releasing the correct attributes. Your institution’s server clock may be out of sync. For security purposes our server allows a 5 second discrepancy between responses. There may be a problem with your institution’s authentication certificate. If your IT department have checked the above and all appears to be correct please contact us for further help.